I really like going through my wardrobe and pairing up different outfits during weekend, and today is no exception. 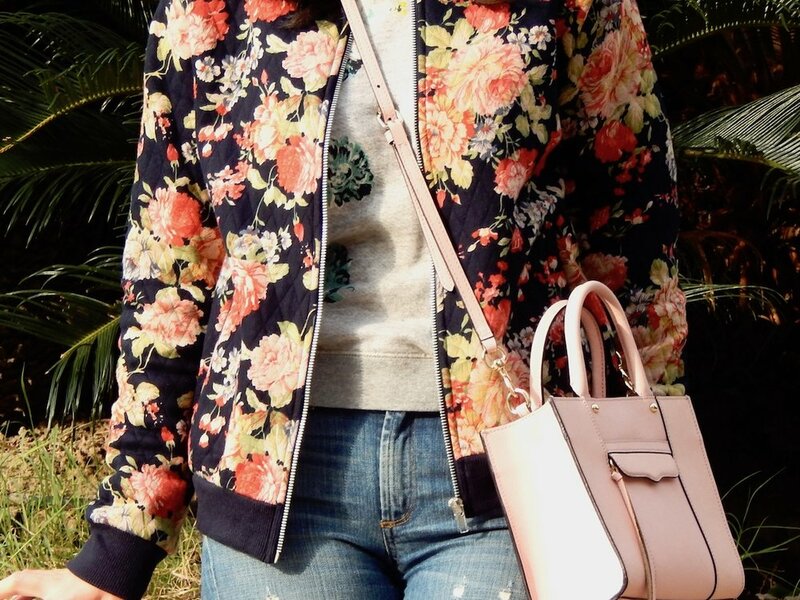 After I spent almost an hour looking through my wardrobe, I finally decided to wear the floral jacket I recently bought from a boutique store, with a floral sweatshirt underneath. Actually it was my husband's idea to pair those two floral tops together. and I have to say they turned out great and looked really cute with each other. I usually wear jeans with casual jackets, so I chose to wear my Toothpick Jeans (old) from J Crew. I'm not a big fan of jeans, but those are the only ones I have kept for long time. As you can see from my previous blog, I have wore them with blazer and they looked professional and fashionable for weekdays. For shoes, I decided to go with my J Crew Suede Ankle Boots, which I purchased last year when they were on sale. They turned out ultra comfortable and walkable even though the heels are almost 3.5 inch tall. I like how slim they are at the ankle area, which make them go with dresses, skirts and skinny pants easily. I have checked on J Crew website and found out the current version for this year. Compared with the ones I have, the heels are a little skinner and slightly taller, while the buckle is wraparound instead of only wrapped on the back.